Call me crazy, but I occasionally get an unarguable hankering to bake. 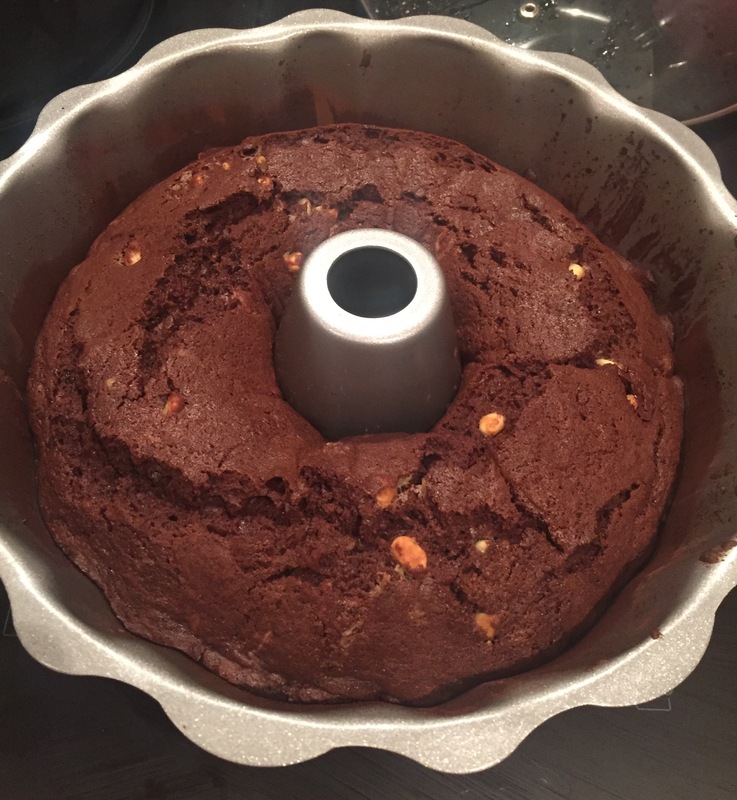 Often it’s a need to bake generally, sometimes it’s a particular type of baking I’m craving, such as bread or biscuits, and sometimes, more rarely, I wake up in the morning thinking “I want to make a chocolate bundt cake today” so that’s just what I did! I reckon if you’re going to go for a chocolate cake, it has to be the most chocolatey creation you can imagine, so this one is triple chocolate with a real chocolate sponge filled with chocolate chips, topped with rich chocolate ganache and garnished with grated chocolate (so technically, it’s quadruple chocolate!). 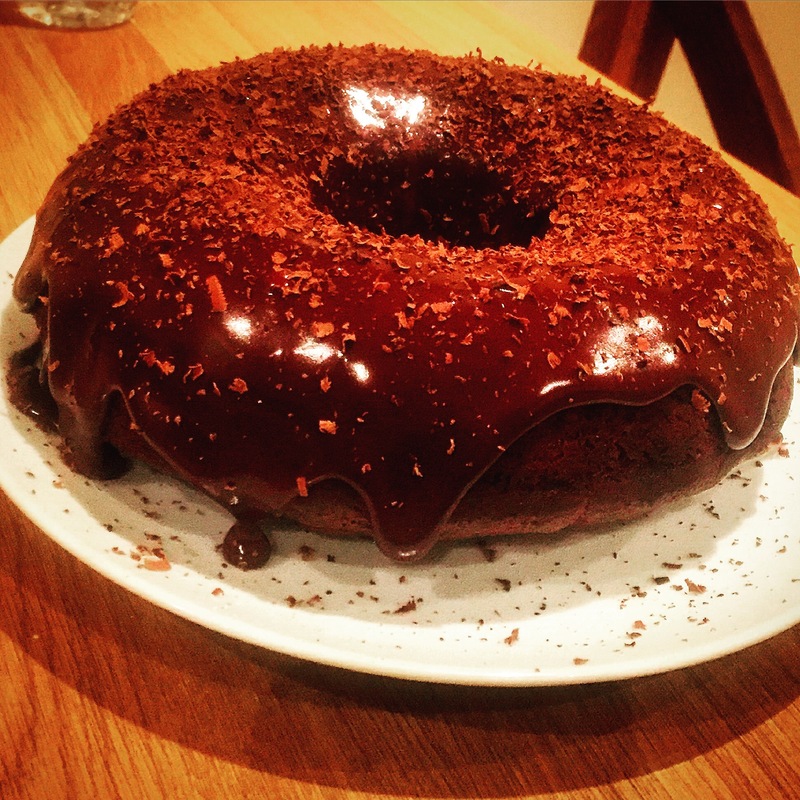 You can of course leave the grated chocolate off, or replace with sprinkles or chocolate curls if you would prefer. 110g good quality dark chocolate, I use the £1 bars from Tesco usually, which have 70% cocoa solids. 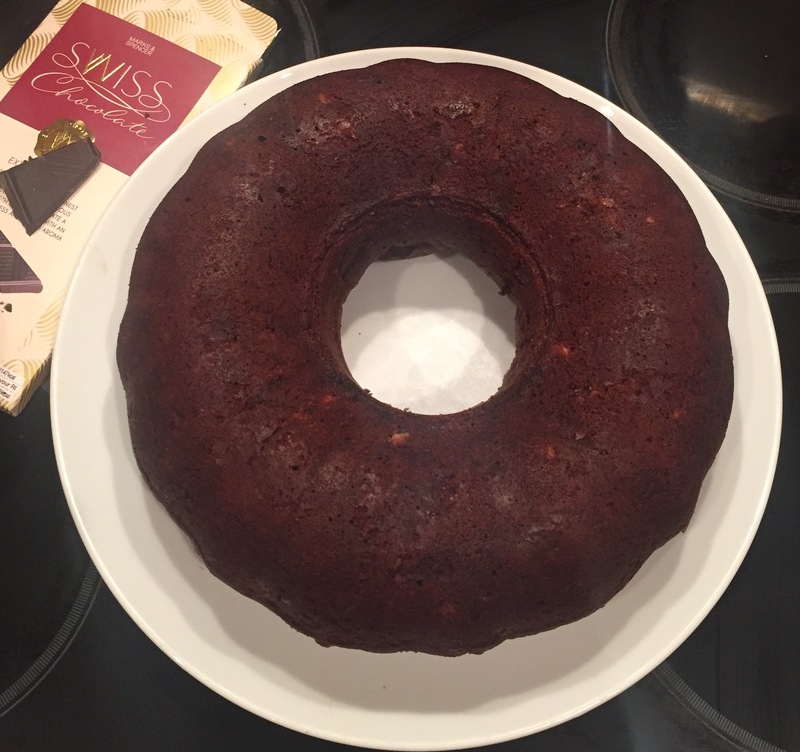 A bundt tin is essentially a ring-shaped tin with patterned sides to give you a beautiful all in one cake, which looks quite the picture on your kitchen or dining room table. You can make all sorts of plain, iced or glazed bundts, and they’re perfect for when you want to make something pretty without going to the effort of sandwiching sponges together. 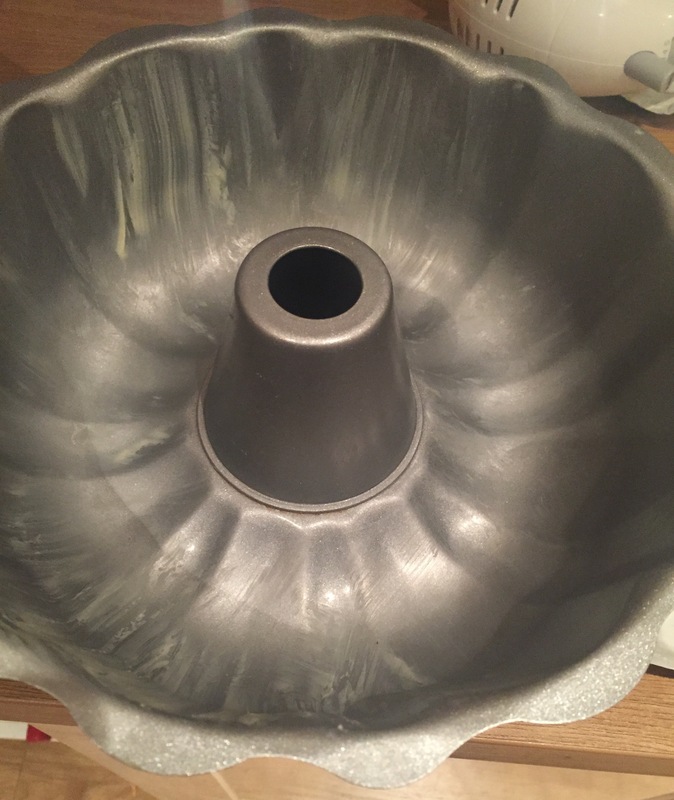 If you don’t have a bundt tin, the sponge will work well divided by two and sandwiched with extra ganache or buttercream, or you could bake it in a loaf tin instead. 1. Preheat the oven to 170c fan, making sure the shelf is nice and low to give you space to settle the deep tin in the middle of the oven. 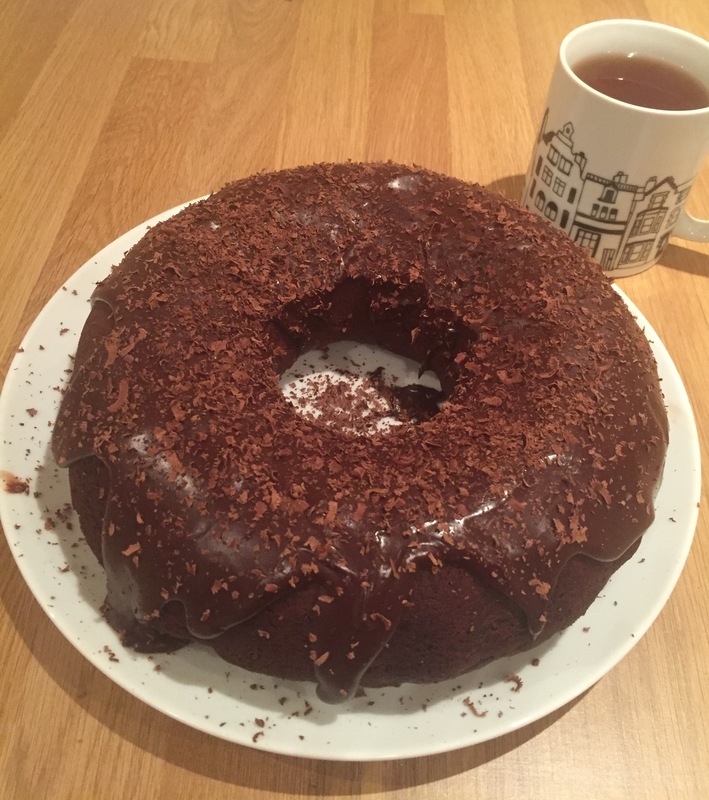 Prepare the bundt tin by buttering liberally (to get into all the flutes you might be better using a pastry brush or paper towel to do this) and coating the buyer with cocoa powder to give your tin some extra non-stick credentials. 2. 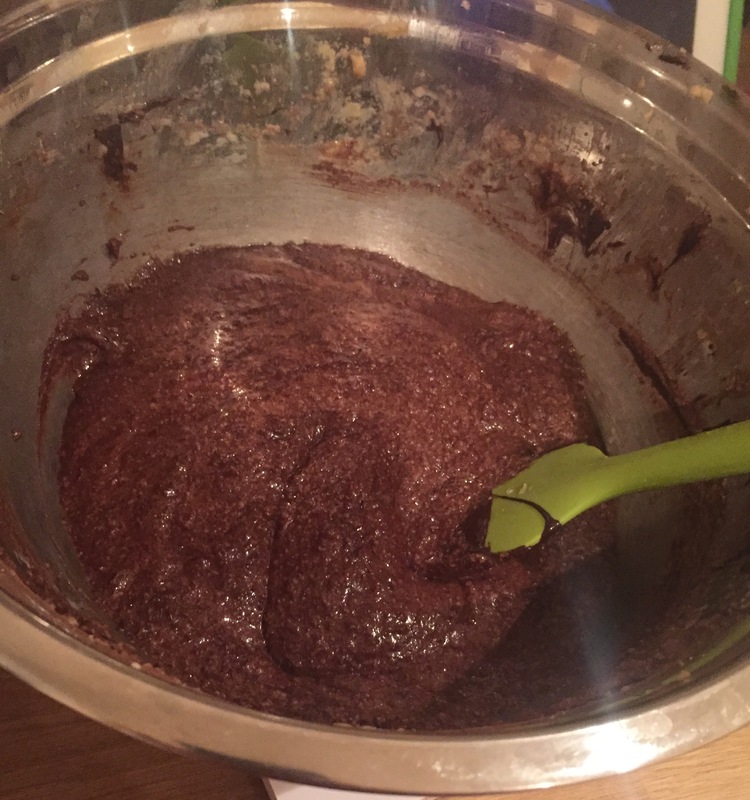 If you don’t have a microwave, set a glass bowl over a little boiling water in a saucepan, set to a simmer and break the chocolate into the bowl. Let it do its own thing until starting to melt, then stir, leave and stir again until all melted then set aside. Don’t let the bowl touch the water and don’t let any water in the bowl. If using a microwave, put the chocolate into a microwave-friendly bowl and heat for 10 or 20 seconds at a time, remove, stir and repeat until melted. Too hot or too long and it will burn and be unusable. 3. 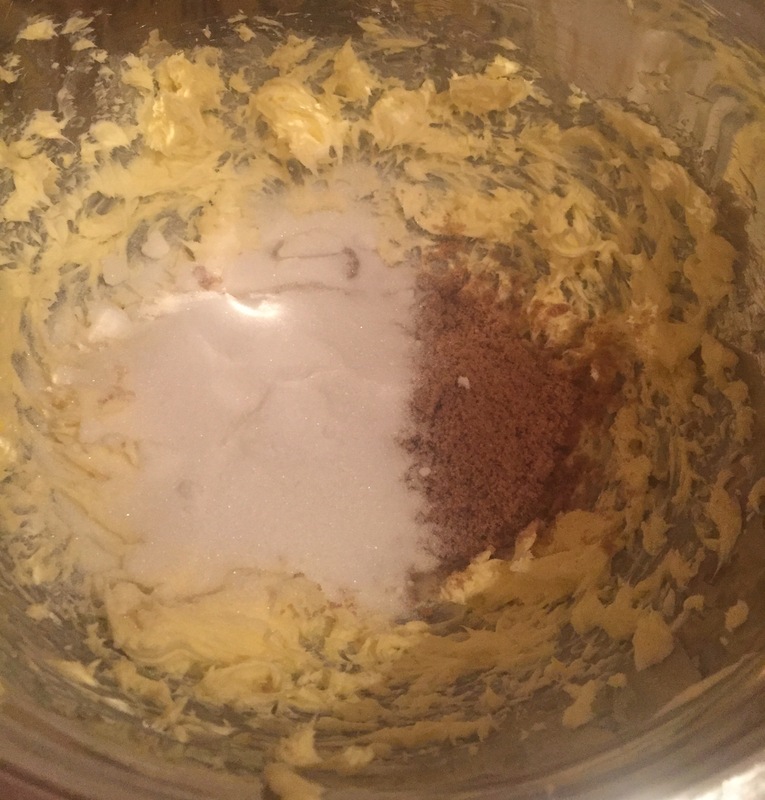 Whisk up the soft butter with an electric whisk until light, then weigh in the two sugars, before whisking again for a good few minutes until combined and creamy. I find it helpful to have a silicone spatula to hand to keep pushing the ingredients down the sides into the belly of the bowl. 4. Next, the eggs. 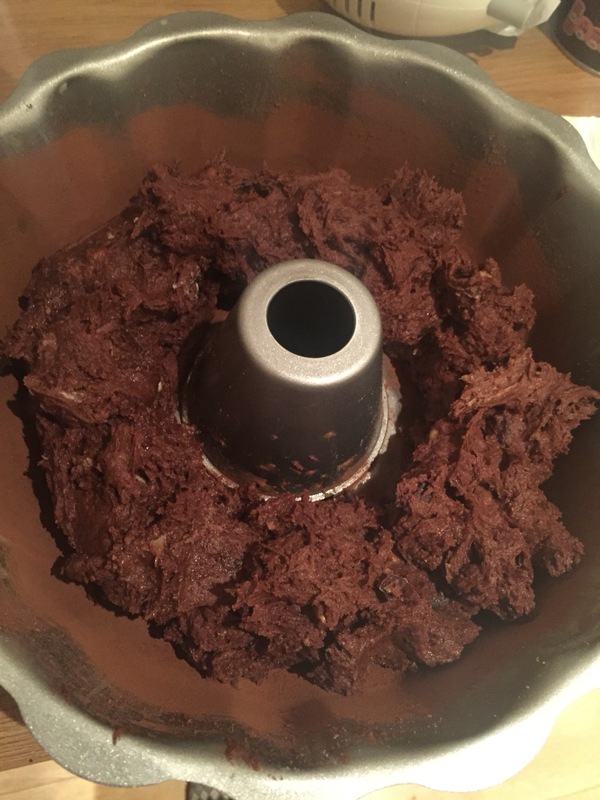 The more air we can get into the cake at this stage, the less likely it is that the cake will go wrong or come out tough. 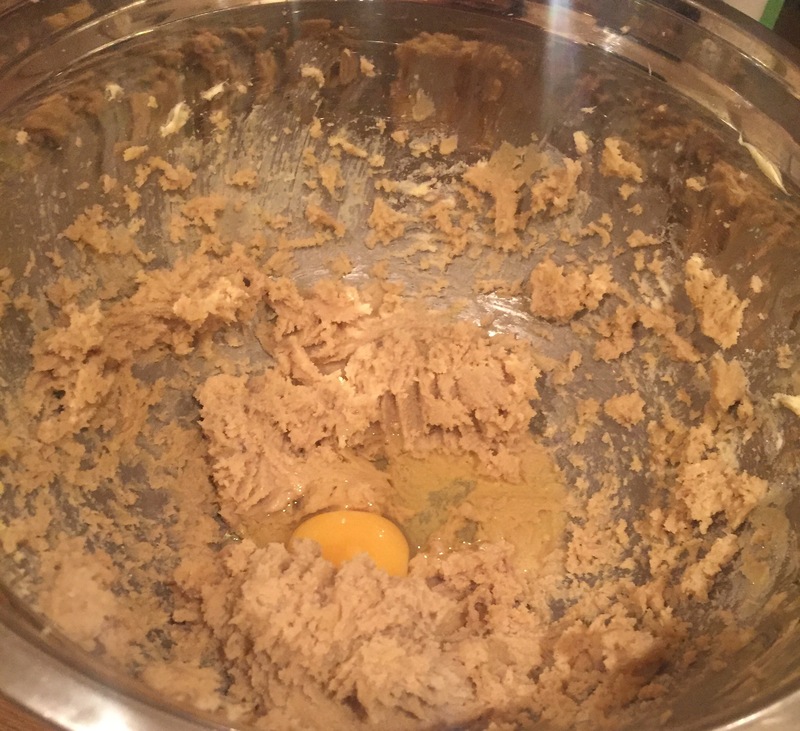 So, with that in mind, slowly combine the eggs by cracking them in one at a time, then whisking them in to the creamed butter and sugar. 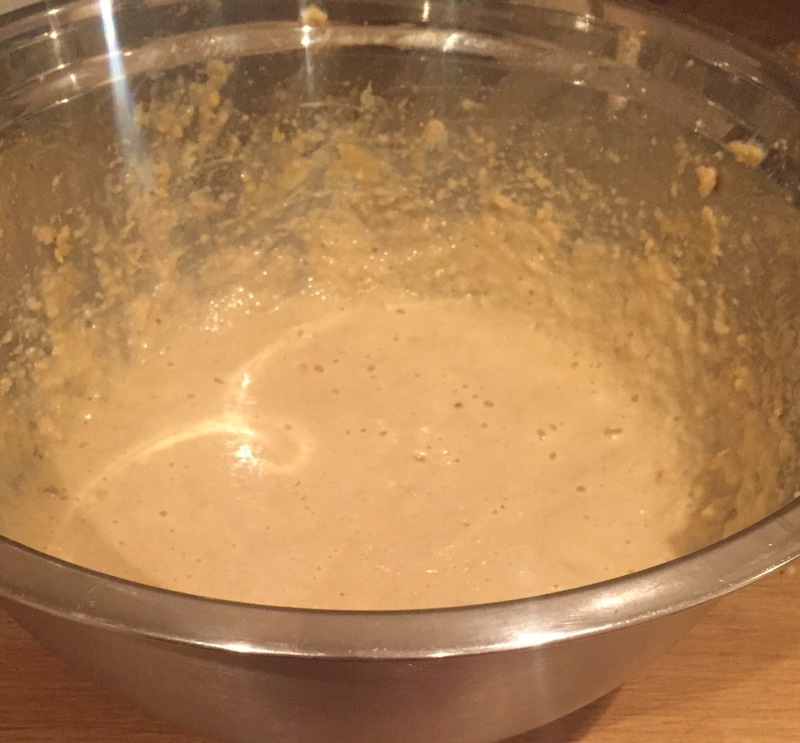 The first egg will loosen the mixture considerably, and by the time all of the eggs are in, the mixture will be quite runny. 5. 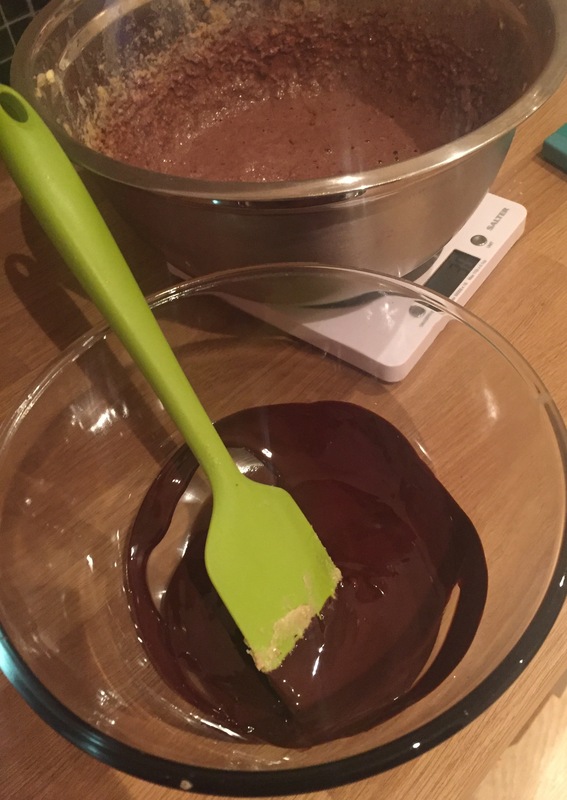 Give the batter another long whisk until it’s really light and airy, then fold in the cocoa powder and then the melted chocolate. 6. Add the salt, flour, baking powder and milk and gently fold until just combined, being careful not to knock the air out of it. Fold in the chocolate chips. 7. 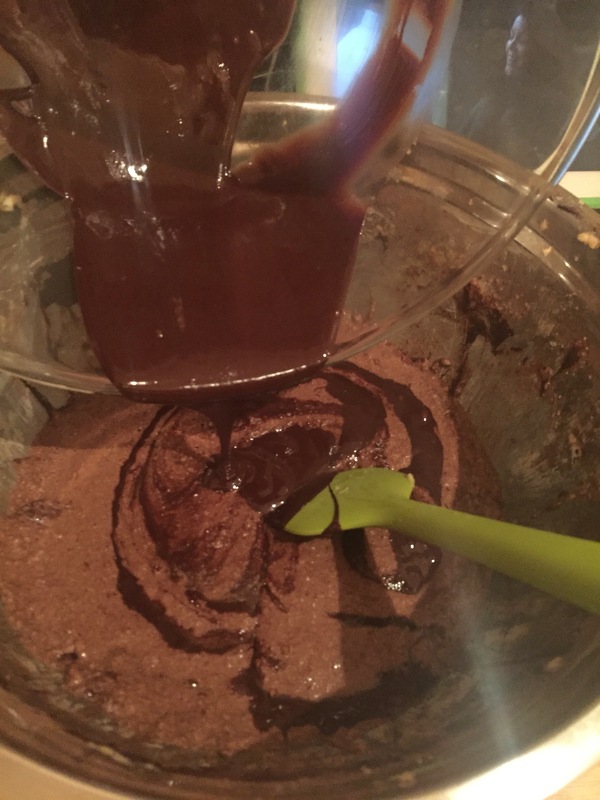 Don’t freak out when you see the thickness of the batter, just spoon it evenly into the tin. Don’t worry about spreading it out; the oven will do that for you. 8. Put in the oven and have a peek after about 25 minutes. It will spread, rise, crack then bake fully. Once it’s starting to look like this, give it a gentle press. If it’s springy it’s done, but if it’s soft leave it in. Mine took about 35 minutes but it will depend on your oven. If you’re nervous you can check if it’s done by inserting a skewer through it gently. If it’s clean when removed, it’s ready, if there are gooey traces put it back in for 5 or 10 minutes. 9. Allow to cool for at least 15 minutes or so until it’s starting to shrink and cool then gently loosen the edges (in and out) with a knife. Put a large plate, cake board or cake stand over the top, flip and carefully set down. The tin should lift off relatively easily. If not, flip, ease with the knife again and flip back to try again. If you’re still struggling, leave it to cool for a little while before trying again. 10. Time to make the ganache! This is so much easier than the professionals make it sound! 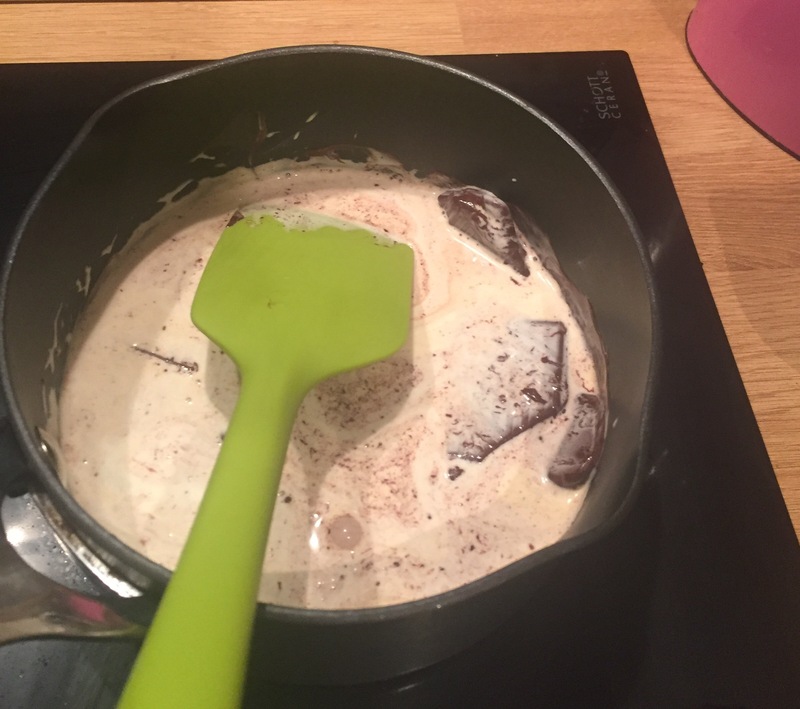 Pour the cream into a small saucepan and set on a low to medium hob. Let the cream warm up but don’t let it boil. 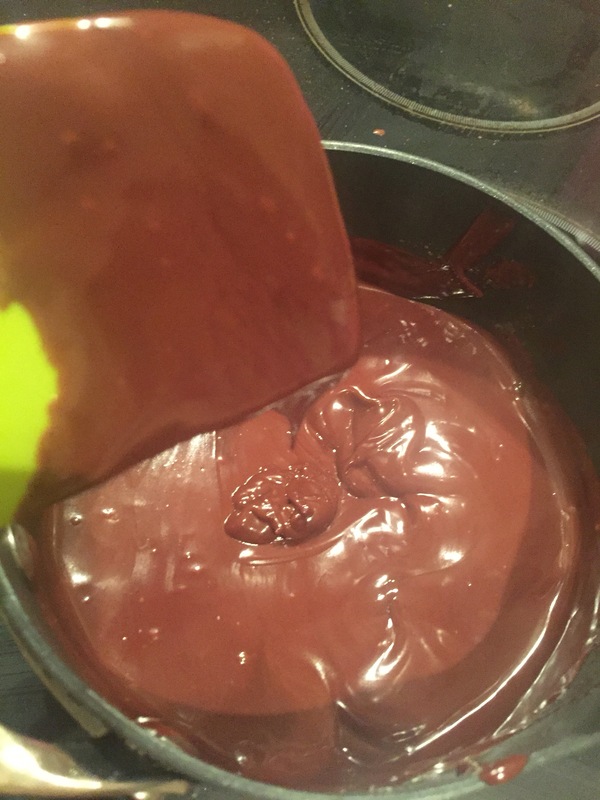 Break the chocolate up and put it straight into the cream, stir until melted, mixed glossy and beautiful. 11. Set it aside and allow it to cool down a bit, stirring every now and then to check the texture. When it’s a bit firmer to the point where it will drop rather than run off the spoon, it’s ready to spread on your cake. If it’s still running off the spoon, it will run straight off the cake. 12. 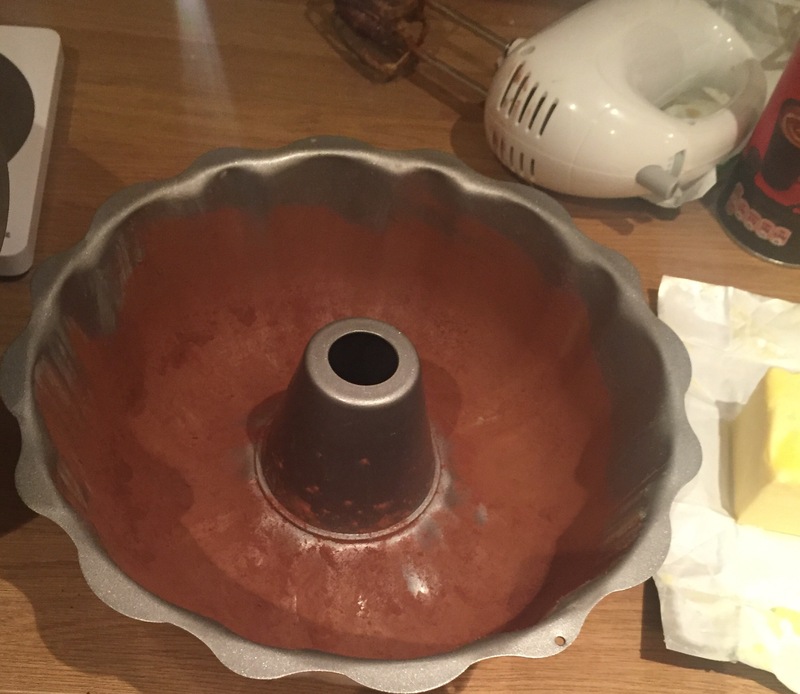 Spread the ganache evenly over the highest point of the cake ring, allowing it to drop down the sides as naturally as you are able – as you can see, it needs to have a little bit of setness about it to give you that irresistible effect – overflowing but going no further. 13. Grate more chocolate over the top or decorate however you wish. Serve immediately or allow to set fully, and be sure to lick the spoon once you’re finished! This will keep nicely for a few days in an airtight container. 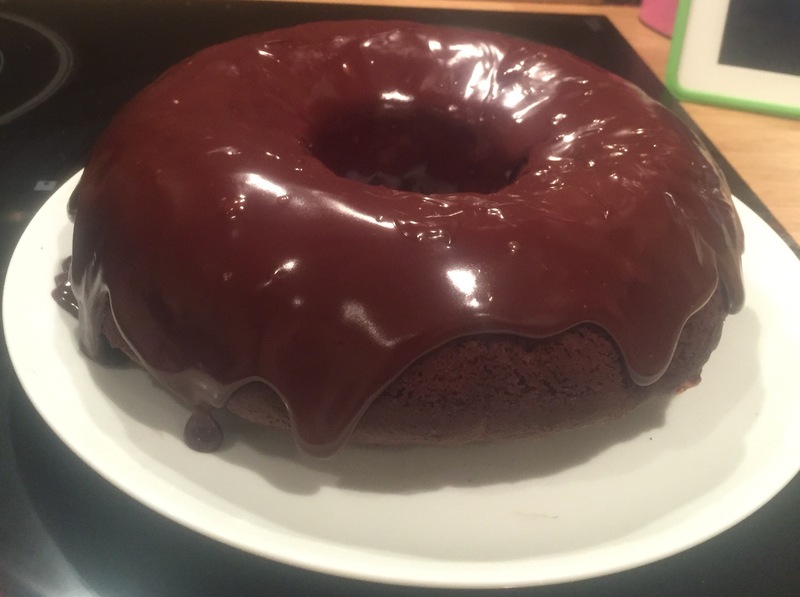 If you have any left once it’s starting to go stale, slice and warm it in the microwave – the ganache will melt, the sponge will soften – and serve as a pudding with cream or ice cream.